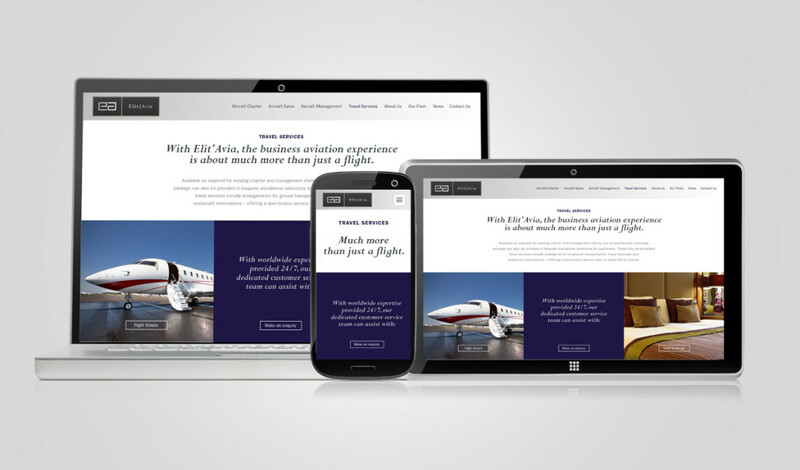 Design Inc has just gone live with a new jet charter marketing website. The Elit’ Avia site which is fully responsive and based on a WordPress CMS platform promotes the caring nature of the exclusive and bespoke private jet related services provided by the company. Elt’ Avia are based in Malta which positions the business ideally to serve both Europe and the Middle East. The company is now managing a Dassault Falcon 7X a Bombardier Global XRS and a Challenger 605 on the Malta aircraft registry, the latter two of which are available for charter. The Falcon will initially be operated privately. Added to the aircraft previously registered under its Slovenian AOC, Elit’Avia now has a fleet of fifteen aircraft that serves clients worldwide, particularly in Europe, Russia, Africa and North America. Jet charter website specialists and aviation marketing are two of the key market sector specialisms of Design Inc, with over fifteen years experience working for clients including manufacturers like Bombardier, owners and operators like TAG Aviation and brokers – both large and small. Design Inc also provides branding, advertising and literature design. Elit’ Avia is a private jet company whose services range from aircraft charter and management to a comprehensive concierge and travel booking service. Raising the expectations of luxury, from aircraft charter and management to comprehensive concierge and travel booking services. A private jet company that can be trusted for the finest details of clients’ journeys. The philosophy at Elit’Avia is to exceed expectations of aircraft management by providing an unmatched level of attention to detail and care in their services and clients’ aircraft. Click here to visit website www.Elitavia.com. Click here to speak to one of our consultants about our private jet charter website specialists services.